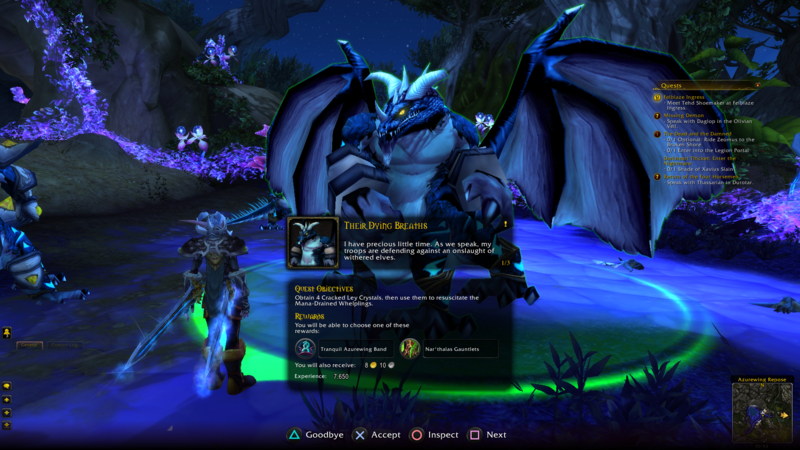 About two years ago, I started experimenting with playing World of Warcraft on a controller - mostly as new way to experience the game during a content drought. It started out with a few simple macros which soon grew into an addon that could handle bindings separately from my keyboard setup and provide some basic mouse handling. From this point on, I knew I had found my new way of playing the game. For me personally, it was a breath of fresh air. As the addon became more advanced and refined, the game experience also became better - to a point where it started feeling like a completely different game. Fast forward to present day and things have slightly changed. 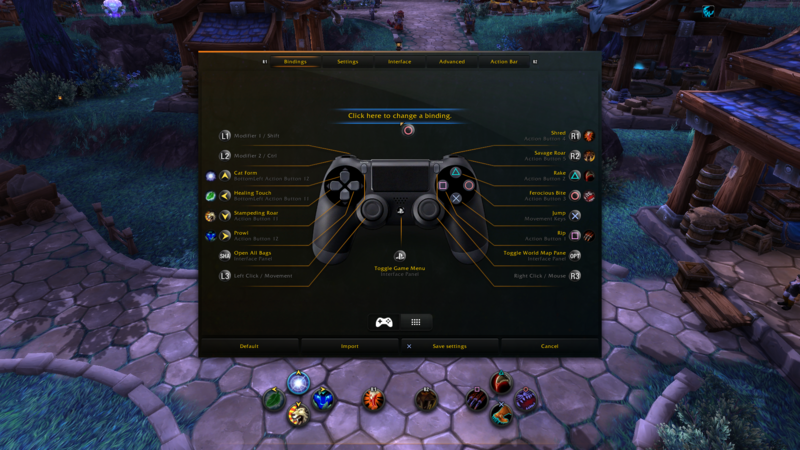 ConsolePort now comes with its own action bar, an extensive configuration suite, an on-screen keyboard and the first modules of a fully custom UI replacement. 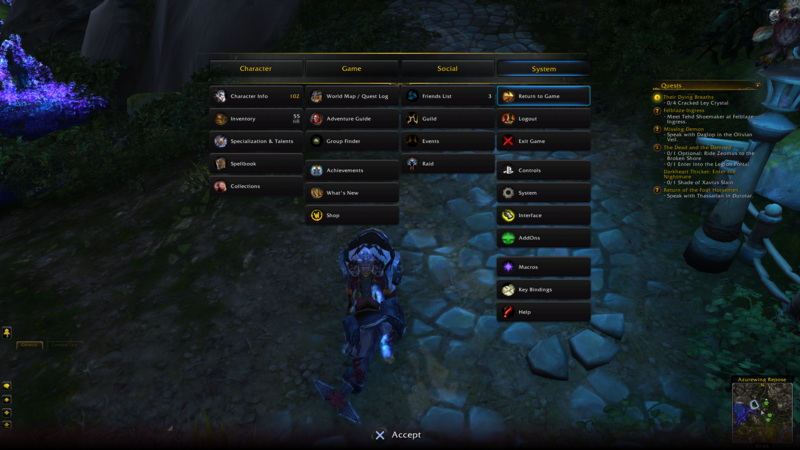 The core addon is in a pretty good state, but it could be much better. The UI/UX in any RPG is a storytelling tool, a game in itself and a large part of the overall experience. This is where a controller becomes the clear underdog, not in the heat of combat. As I'm writing this, ConsolePort comes with a user interface framework, with two modules built on top; quest & gossip and a custom game menu. These are currently the only two modules in the ConsolePort bundle. ... but this is just the start. I would like to fully replace the entire user interface in the game. This is a huge undertaking, for which I will need your help. Currently, I can only offer up a few hours of free time a week to this project, which means that the progress is extremely slow. Most of the time is spent purely on maintenance. I want to dedicate more of my time to development, but time is money, friend. ...unless you help me. In exchange, I'll be releasing new content ready for testing to patrons. Up until now, only a select few people get to preview new content when it's stable enough for testing. While this content won't be fully completed or premium in any way, it still gives you the chance to get your hands on new exciting changes but also to help out in the development process and make the design choices together with me. Stable interface modules will become part of the ConsolePort bundle, completely free and accessible on the regular distribution networks. Hopefully you can help me get them out there a lot quicker. As an official patron, you'll have access to my patron-only feed with project updates. You'll also get a rare quality upgrade in the community Discord channel. Become an epic guinea pig and get early access to new content ready for testing. You'll also get an epic quality upgrade in the community Discord channel. In gratitude for your unwavering support, earn your legendary rank on Discord, along with all previous rewards.